O.J. Simpson was planning to go to Florida after being released from prison, but decided against it due to damage from Hurricane Irma. Simpson instead stayed in Las Vegas. Hours after he settled in his home on Sunday, a lone gunman killed 59 people and injured at least 527. Simpson’s lawyer, Malcom LaVergne, spoke with Simpson on Monday and made a poignant comment, New York Post reported. “I spoke to him this morning, and he was ‘What the heck is going on?’” LaVergne said. “And I said, ‘Well, I hope nobody tries to pin any of this on you,’” LaVergne added. 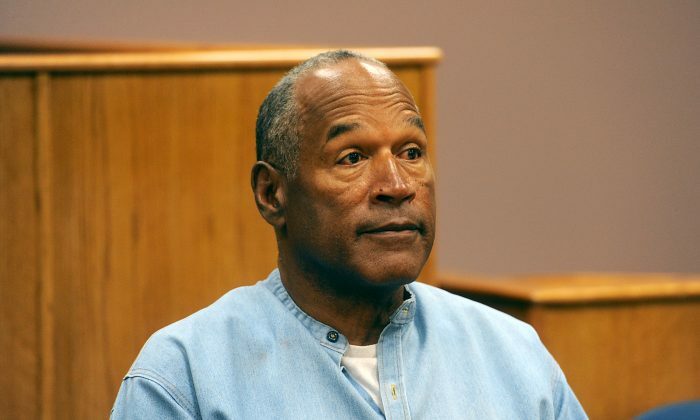 Simpson was acquitted of murder charges in the killing of his wife in the 1995, but served 9 years in prison for an attempted armed robbery in 2007. LaVergne said that the home Simpson’s was going to move into was damaged by Hurrican Irma. He didn’t want any drama, he wanted to wait it out in Nevada,” LaVergne said. Police sought clues on Tuesday to explain why Stephen Paddock, 64, a retiree who enjoyed gambling but had no criminal record, set up a vantage point in a high-rise Las Vegas hotel and sprayed bullets onto the concert below in what became the deadliest mass shooting in modern U.S. history. Paddock left no immediate hint of his motive. He was not known to have served in the military, to have suffered from a history of mental illness, or to have registered any inkling of social disaffection, political discontent, or radical views on social media. Police said they believed Paddock acted alone. Although police said they had no other suspects, Lombardo said investigators wanted to talk with Paddock’s girlfriend and live-in companion, Marilou Danley, who he said was traveling abroad, possibly in Tokyo. The closest Paddock appeared to have ever come to a brush with the law was for a traffic infraction, authorities said. The death toll, which officials said could rise, surpassed last year’s record massacre of 49 people at a gay nightclub in Orlando, Florida, by a gunman who had pledged allegiance to the ISIS terrorist group. His brother, Eric, described Stephen Paddock as financially well-off and an enthusiast of video poker games and cruises. Las Vegas’s casinos, nightclubs and shopping draw more than 40 million visitors from around the world each year. The Strip was packed with visitors when the shooting started shortly after 10 p.m. local time on Sunday during the Route 91 Harvest music festival. Video of the attack showed throngs of people screaming in horror and cowering on the open ground as extended bursts of gunfire strafed the crowd from above, from a distance police estimated at more than 500 yards.